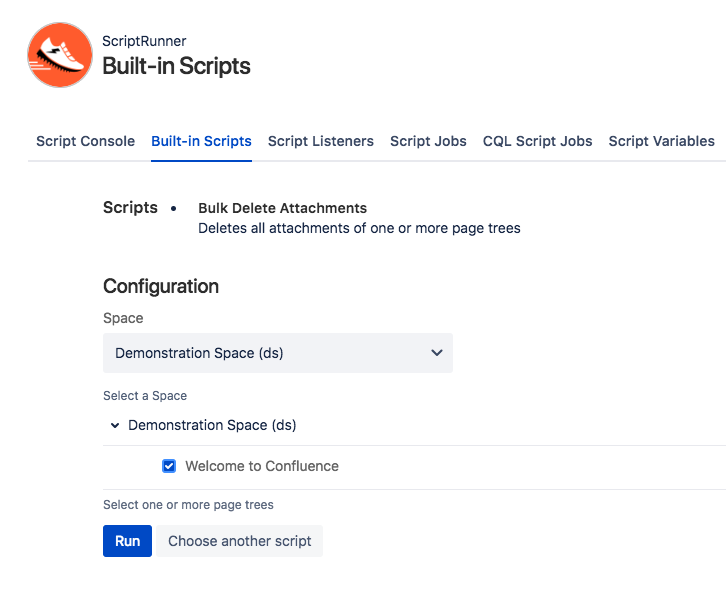 The Built-in scripts feature is a selection of useful automations designed to automate time-consuming tasks and give you the ability to better control your Confluence content. 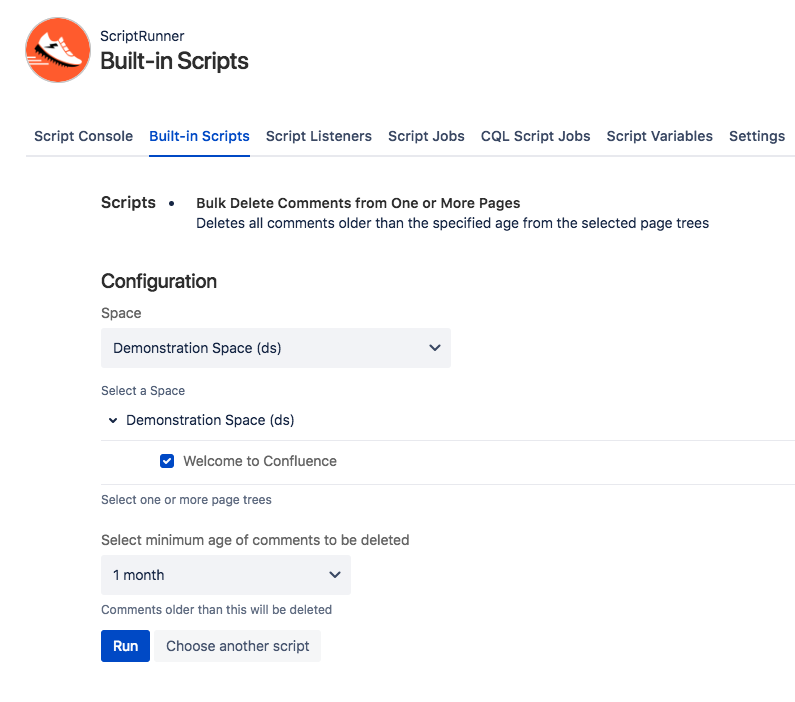 Built-in scripts can only be used by Confluence admins and by space admins. 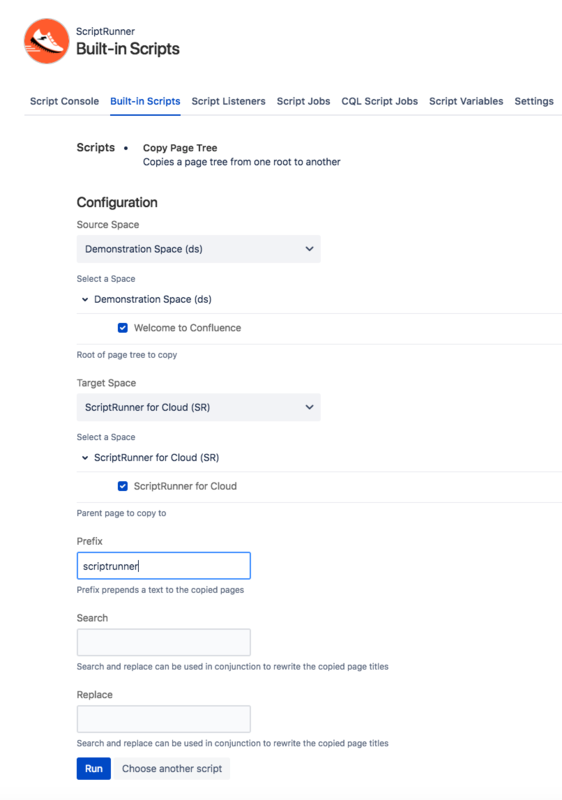 Note - To find out more about assigning space admin permissions, take a look at Atlassian’s documentation. There are slight differences differences between in this feature dependent on admin status. Navigation is different to built-in scripts and advanced space functionality, please see below. 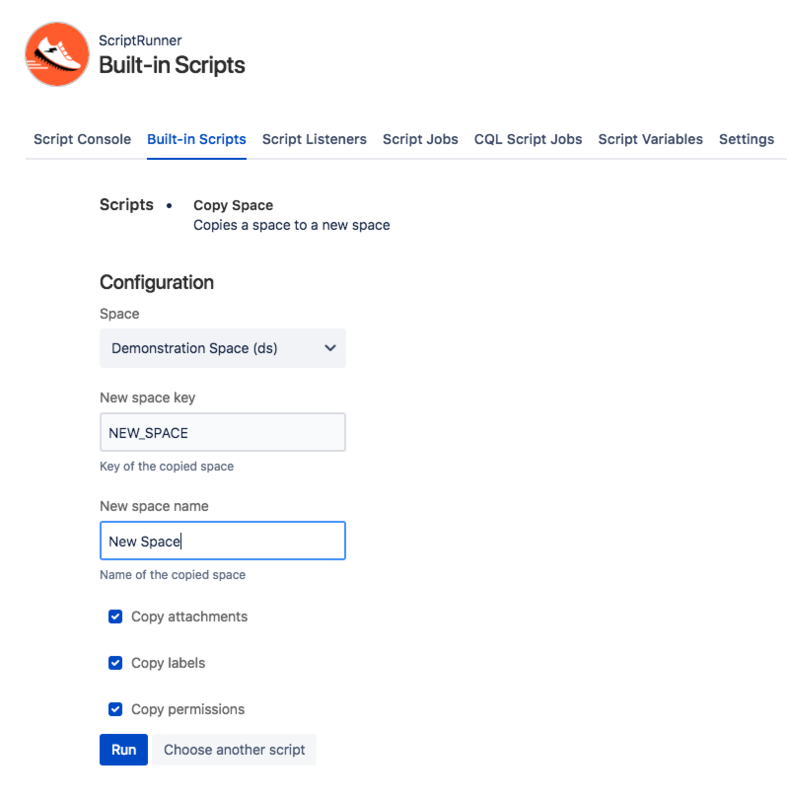 By default all space admins can access all features in the Advanced Space Functionality menu, to restrict permissions take a look at our permissions documentation here. 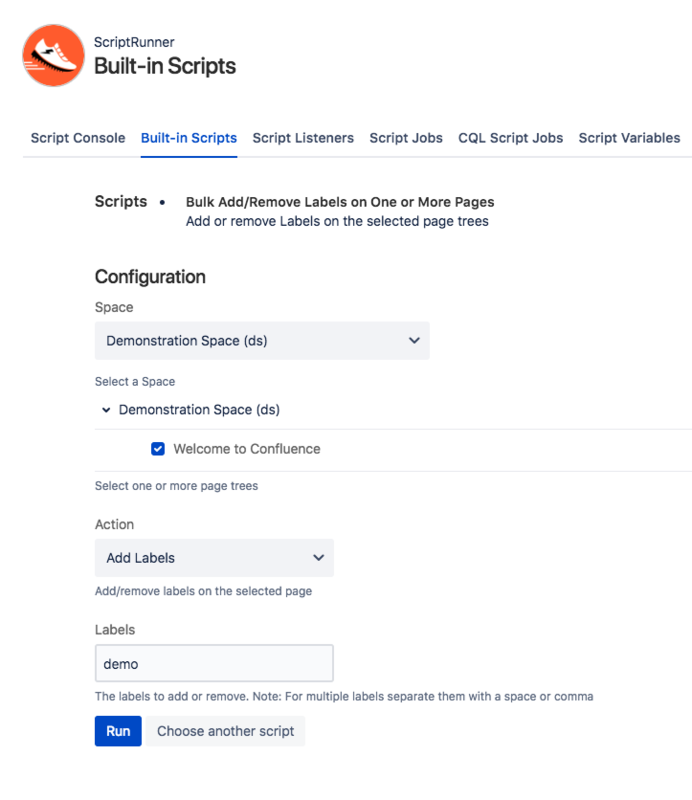 This feature gives you the ability to add or remove labels on selected pages within a space. You can select all pages within a page tree, that is a page and all of its children, that is a page and all of its children, select individual pages within a space or a combination of both. Note: If you’re updating multiple labels you must separate them with a comma. This feature allows you to delete all attachments associated with a page or pages. Note - this feature will delete the attachment on all versions of the page or pages. This feature deletes all comments that are older than a specified age from one or more pages. You can select all pages within a page tree, that is a page and all of its children, select individual pages within a space or a combination of both. Choose the minimum age of comments to be deleted. Note: Comments older than the minimum specified age will be deleted. For example if you select the '1 day' option, comments older than a day will be deleted on your specified pages. 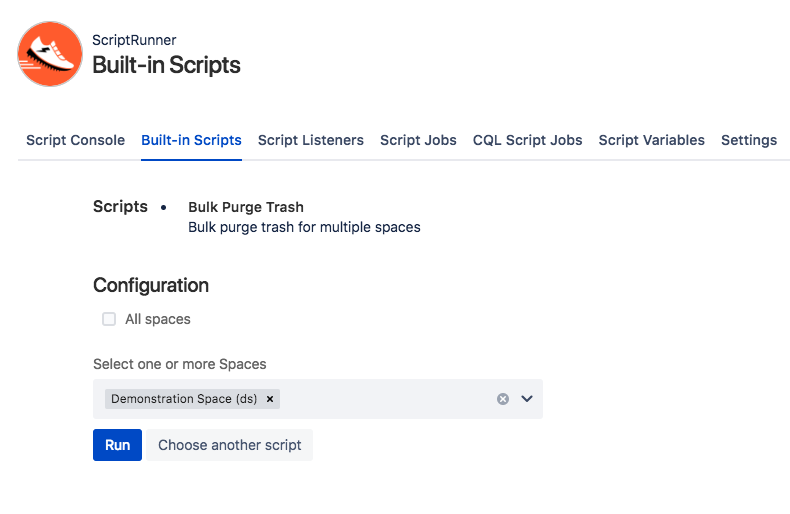 This feature allows you to purge all trash for one or all spaces. Note - This is a permanent action, once you’ve emptied the trash, content won’t be recoverable. 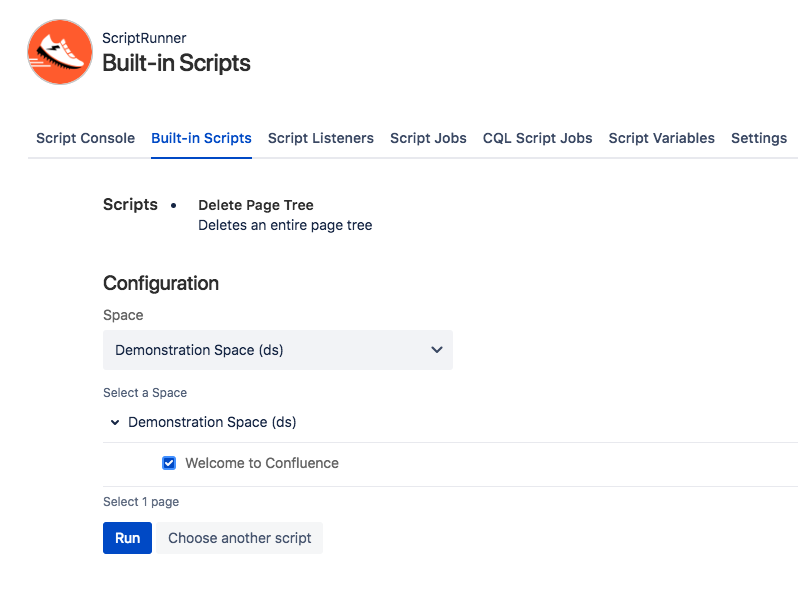 This feature allows you to copy all pages within a page tree, that is a page and all of its children, to another space or to the same space. When copying you can rename pages or add a prefix to copied pages. Note - To use this feature you require view permissions on all the pages you are copying, plus edit permission in the space that you are copying the page tree to. Note - Links and image links within the tree of pages you are copying will automatically be updated to reflect any new page titles. This feature allows you to make a complete copy of an existing space. 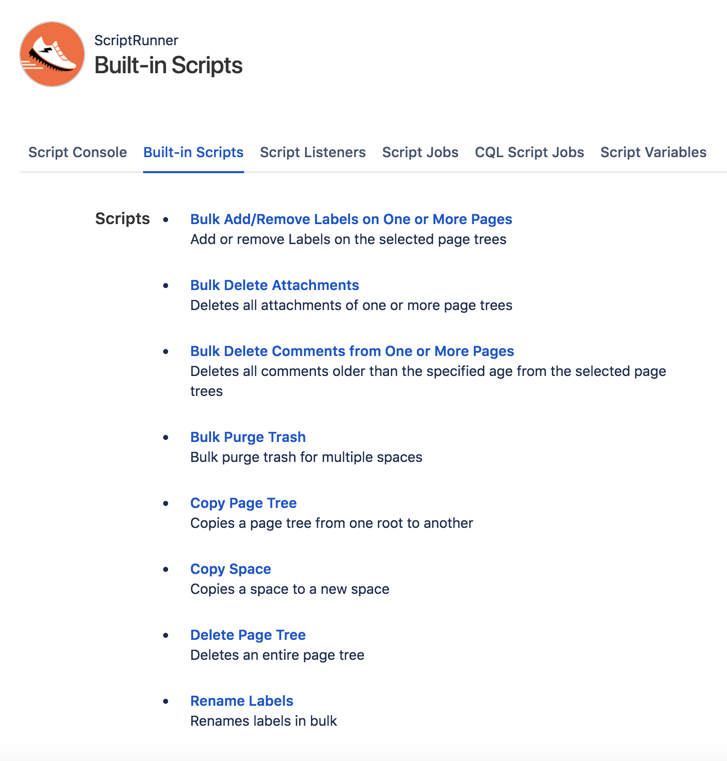 This feature allows you to delete a page tree, that is a page and all of its children, that is a page and all of its children. Deleted pages will be moved to the trash. Note - You must have the edit permission on all of the pages that you’re trying to delete. 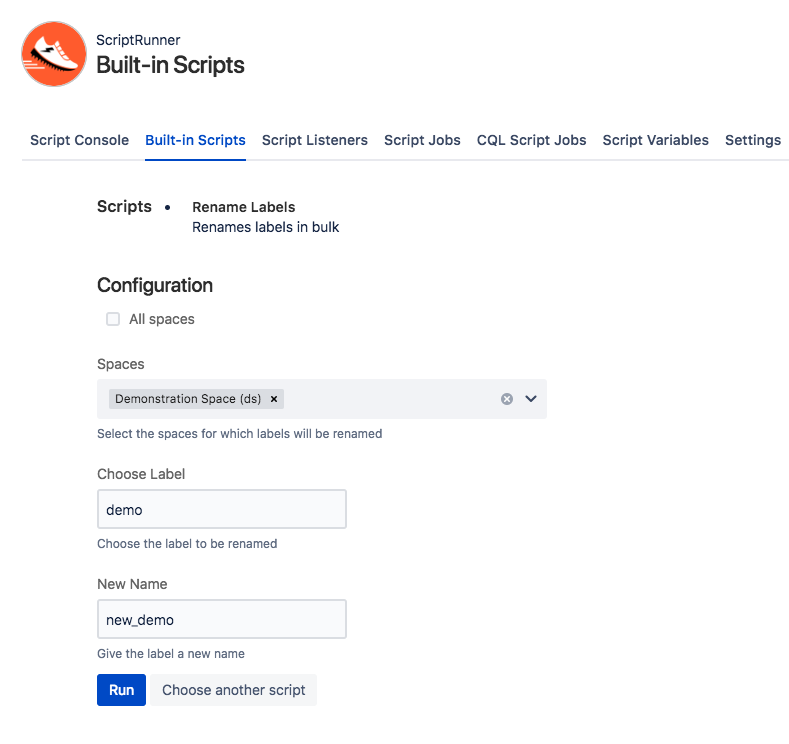 This feature allows you to rename labels on a space or all spaces. Select a space or tick the checkbox to choose all spaces. Note - labels are not case sensitive.